This year’s theme “Together for Gender Equality” embodies Canada’s commitment to the global effort to address gender inequality and encourages all Canadians to take part in advancing gender equality in the world. 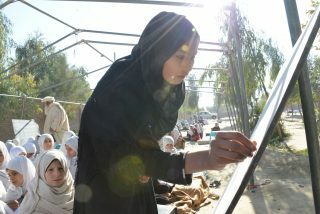 Through PWS&D, Canadians are supporting vital projects in development and relief that are promoting and advancing the rights of women and girls—ensuring girls have access to education, empowering women and girls to claim their rights, expand their livelihoods, build healthy futures and improve their prospects for the future. Thanks to PWS&D’s faithful donors, advocates, supporters and partners, we are reducing global poverty and building hope and prosperity for all creation—one person at a time. PWS&D has joined with organizations from across the country to promote International Development Week—learn more about IDW and ways to get involved. Celebrate what Presbyterians across Canada are doing to help end global poverty! International aid is a central piece to achieve poverty reduction. This International Development Week, show the prime minister you support Canada’s role in helping to end global hunger and poverty. Sign an I Care postcard! To help sustain PWS&D’s life saving programming, make a donation today.